Stuffies is a concept EP, a short book, and I am preparing it to pitch as a film or animated series. I will be meeting with a senior animator at Pixar in the next few months to pick his brains on this process. Why you should work on this? Hopefully you can see from the demos and my last book (links below) this is going to be a high quality project. Good as a portfolio piece. You meet and get to work with some pretty cool people. You share in the work and the credit of making something you’re proud of. There might even be some pay in it. But you won’t get rich. On the optimistic side this is a project that could go somewhere. I already have a promotions guy lined up for the EP and he owns a small distribution company with ties to many retail stores in the US and abroad. And there is always the extremely unlikely (1 in 13,020) chance it gets picked up as a major motion picture, cartoon network series, and touring show on ice. Who I’d like to work with: I’ve been in lots of bands over the years and the best ones had people I liked. So getting along, being able to work together, hanging out socially, are the most important things for me. Second, people that have ideas, points of view, but are still able to take critique and direction. Third, Multipliers. I don’t need someone who thinks exactly like me or has exactly my taste or opinions. I’d prefer to have someone, who, when we work together, we come up with something better then I could do on my own. That is also something all my best band experiences had in common. I see this as a collective of the right people. People who might know each other years after this project is finished. Who may support each others projects and work together after this is finished. The Story: This is the story of a little girl who creates an imaginary stuffie (stuffed animals) world while on summer vacation in Maine. The Story is told from the animal’s perspective. The EP is close to linear. It’s about a child and her world but it’s NOT a typical kid’s book with kid’s music. It’s not dumbed down, uncomplicated, or sickeningly sweet. It’s more a kin to Maurice Sendak or Shel Silverstein’s work. It should work for kids and adults like the Toy Story movies. Here are the tracks which tell a good part of the story. 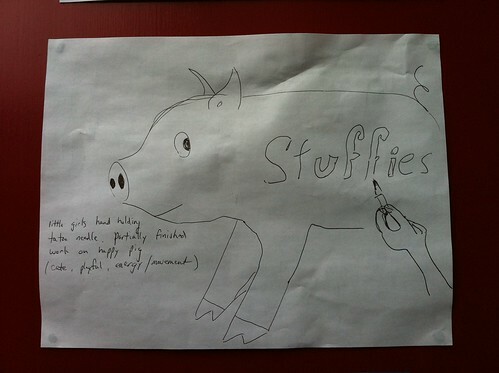 track 1: The pig shares a poem about his experience with a jelly fish. track 2: “Stuffie Party” The animals anticipate the girl’s arrival. track 3: “So you know” The animals talk about the group dynamic and day to day life. track 4: “Hey pig” Conflict, explanation, and resolution told by the snake. track 5: “Pig’s a winner” The pig finally wins something! track 6: “We’re gonna miss her when she’s gone” The animals anticipate the girl’s departure. track 7: “A public service announcement for unicorns” The girl has some advice. They are demos, but pretty far along. Track 1 is recorded but not posted yet. I am still working on the book. Here is my first book. It has a five star rating on amazon and I don’t mind saying… It’s pretty good. : ) So, while I’m not a seasoned writer, I’m not a total novice either (although I can’t spell or punctuate). Musicians: I’m looking for musicians to add some flavor to the tracks or possible take them in a new direction. Drummers, guitarists, piano/keyboards, bass, vocalists, and horns (trumpet, french horn?). Illustration: I need help doing the album cover, the book illustrations, and perhaps help on the short film montage (stills? etc). 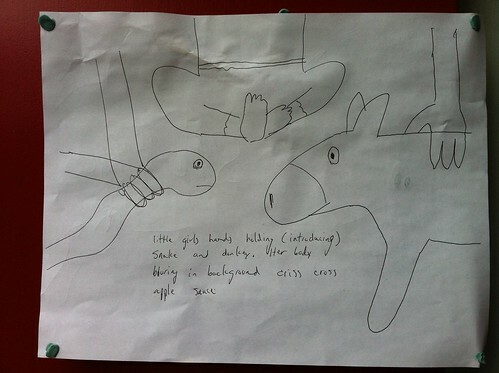 Below is the prototype sketch of the album front and back. I am actually thinking of pressing vinyl. crazy? Here are the character development sketches. Below are sketches for the front and back of the EP. Live performance: This is a secondary idea I’ve also considered. The book builds the context for each song. For example, it would start off describing the animal’s wait through the seasons for the girls return. This would lead into the first song where the girl arrives “Stuffie Party Tonight”. On stage a narrator would read the book while the book is projected onscreen. Then the musicians would take over for the song while part of the short film is projected. Obviously I haven’t finished the book and worked out the details but this is the jist. A bit about me: I’m a “creative type”. There has never been a period of time when I wasn’t drawing, making music, having insane ideas, or doing a bit of writing. I don’t thrive in a 9-5 corporate environment. I thrive around fun, creative types. Most of my energy has gone toward music. I write, record, mix, and perform (sing, guitar, drums). I have a nice home studio behind my house where I fritter and waste the hours. I have also been an art director (online advertising/marketing), a graphic designer, and flash developer. I didn’t plan on doing kid’s books or music. But my creativity has always expressed my experience and right now I have an adorable 8 year old. I am eclectic as my music demonstrates. I’ve also written a good deal of something like angst filled hip-hop metal® : ). I’m grounded and practical but also insane (in a good way). Shaky Terrier is starting to sound like a song. Yay. One thing I learned from listening to the Flaming Lips was: You can have more then one bass. While screwing around I happened to have 3 basses pulled up on the mix. I liked it. So these tracks have 3 bass lines for the most part. All hit up with Reaper’s bandisto, a kind of transistor distortion. They were meant to be 3 unison tracks, and are at times, but I liked the mess of mostly-unison. So here it is. Finally got the key or finally settled on one. 1/2 step can make a big difference. Note that self. I’ve wanted to use my live drums for some time. Just another sonic palate. I used the mic that was set up for my vocals. One mic that is about 12 feet from my snare. Sounds pretty good. I may just stick with that. Although my playing is whoa-fully late on the kick. On top of these drums I plan to sing “Mr. Fritzy Kibbleton”. It’s kind of a chorus-anthem thing. I have some other ideas… adding variety to the BFD drums, doubling the length of the Shaky Terrier Chorus. We’ll see where it goes. I may as well admit I won’t be finishing this album on time. My self imposed deadline was tomorrow. Although I have enough material recorded there is still the matter of mixing, fixing, artwork, etc. I’m ok with the lateness. I’ve still done a lot in six months. I’m more then 70% there I’d say. Better progress then I’ve made in years. My current song, Shaky Terrier: Mr Fritzy Kibbleton, is coming along slow. Here is something. Here’s the first attempt at this song entitled “Shaky Terrier: Mr Fritzy Kibbleton”. It’s way rough and I bet barely recognizable from the final version. It’s great when you don’t take your own advice and then end up doing extra work. A while back I talked about choosing the right key for a song early on. I generally pick a key where my voice fits the song. If it’s a high energy song I might put my voice near the top of it’s range. If it’s a chill song maybe more toward the middle. What I generally don’t like is singing most of the song in a strained place. I think it’s worth spending some time figuring this out because the final vocal usually comes after all the other tonal instruments. you don’t want to re-track all the guitars, the bass, and keys just because you decided your voice sounds better down 3 half steps. Ooops. And that’s what I just did. I think a good exercise for picking a key is to sing the whole song out loud a few times. Intuitively you may start where your voice works best. I just did that and came up with the key of #G on this one. If you don’t have success with that try using a piano and starting on different notes. Eventually you’ll find a starting place that makes the whole song sound good. It’s also been helpful for me to wait a few days after I’ve rehearsed a song. It’s hard for your voice to open up and be relaxed when you aren’t totally familiar with the timing and rhythm. After a few days of practice you may find you are comfortable up a few half steps (if you want to go there). It’s been some time so I’m just going to lead with some work. A bit of technical stuff will follow. This one is called “Make Up in the Car”. Here is an earlier version. Here is a later one. I don’t know how finished this is. I do know I’m getting burned out on it. It’s a better idea to move on to the next song. Now for something more technical… I’ve been trying to facilitate fast recording. The idea is to capture ideas very quickly. One thing I’m doing regularly is setting my vocals up for quick compression. That way I can hear how it will mix faster. It also lets me compare vocal takes quickly. Here is how it works in Reaper. Reaper lets you define your custom settings as defaults. So I can set up a default compressor with the ratios and thresholds I like. I can set up a default track to have two instances of that compressor. Now every time I add a new track I get two compressors loaded on it (in bypass) with my settings. The compressor’s threshold is tuned for a normalized vocal. So I normalize the vocal and I’m good to go. I spent some time dialing the compressor in. I wanted to compress things a lot but not hear the compressor. What I figured out is compression at low ratios (2:1, 4:1) starts getting heard at about a -6db reduction. That’s when they start to sound like someone is cranking down the volume. There is a bit more to this. Obviously there were some other parameters I needed to change to get a natural sound… attack, pre-attack, and this is only valid for Reaper’s ReaComp compressor. Also note the second compressor will not be operating on a normalized peak of 0 since the first compressor will knock that down. I know someone is going to say this is equivalent to using presets. We all know presets can be useless on the wrong source. But in this case it’s not quite the same. I know the maximun peak on the audio. And I’ve tested out my settings on the compressor. So imo it’s just a time saver. kind of like a custom preset. Something I’ve been meaning to do it try and finish a song in one day. For me that’s about 4 or 5 hours when you count the actual work time. Anyone who says they are creatively productive for more then 5 hours a day is either lying or exceptional. They are lying. If they aren’t I wish they would so I could feel better about my snails pace. So here is a song called make up in the car. It’s about how my wife gets up so very early each day and each day we still scramble out of the house to school. And where does that time go? Once again the second half of breakfast and makeup take place in the car. Guess I’ll have at it. Lets call this an exercise in breaking my normal work patterns. Something I think is important. Ok. Day over. And here we have it. It’s far from a full song. But something very nice happened. Or I felt something very nice. For the first time since I started working on this song I’m starting to think it could work. That is, be a good song and be put on the album. Some songs, maybe this one, are very delicate. If you don’t get the right rhythm they fail. If you don’t pick the right key they fail. If you don’t have the right tempo they fail. If you don’t sing them right they fail. Speaking of singing. I tried this one in 2 different keys. Tried singing it at medium volume and low volume. Tried micings at 14″ and 24″. I pretty much always sing off axis now. That tames the sibilance in my voice. What I figured out on this song is I like to sing back at about 20″, sing at a low volume, and sing in a higher key so the high notes are around an F3 (if I’m counting keys right). Getting the vocals right was what made me think this song could work. They are still very unrehearsed and the lyrics need to come together. Maybe today. What did I say about writing rap lyrics and learning Ableton Live on vacation? Well it’s over now and I’m certain I didn’t do either. After a day of “normalizing” back in San Francisco I have now sequestered myself in the studio. I’ve even produced some lyrics. All I can say is, when you get in the zone or flow or whatever you call it, write as much as you can. That’s a place hard to get back to. Although I’ve come up with some topics I like they aren’t exactly lyrical. Here are some examples. Keep in mind the theme of the song is someone turning 40 or go listen to it in my last post. Every time you look in the mirror you see something new. Hair is missing from a good spot and growing where you don’t want it to. I guess you’ll have to hear this stuff in context to make full sense of it. The issue I’m having is these sentences don’t fit into the syllable patterns I need them to. And even if they do the accents aren’t in the right places. For example, I might have an “s” sound where a vowel would work 5 times better. As I listen to what I wrote two years ago I realize how well it works. Ok, new day. This is actually day 3 of semi writer’s block. Let me tell you what has worked. Two days in a row I woke up slightly hungover and had immediate ideas. This morning I wrote what will become that extra verse. Just sticking with it for 3 days has helped. Every day my thoughts became more… congealed. And what didn’t I do to shake the writer’s block? I took breaks. I walked away for a while. I broke out the large artists notebook (I like to write on spacious black pages). I listened to some rap I like. I listened to some William S Burroughs giving advice on aging. I re-read the old email from Katie that started this whole thing. I tried to list the themes I’d covered in the old lyrics so that the new lyrics would be fresh ground. I paced the room bouncing a tennis ball while thinking lyrics (something I heard Paul Simon does). I searched online for “things that change when you are 40”. That actually lead me to include “lawn care” in the song. I played drums for a bit to clear my mind. I went to a site that generates Brian Eno’s oblique strategies. I flipped through 10 and considered each. 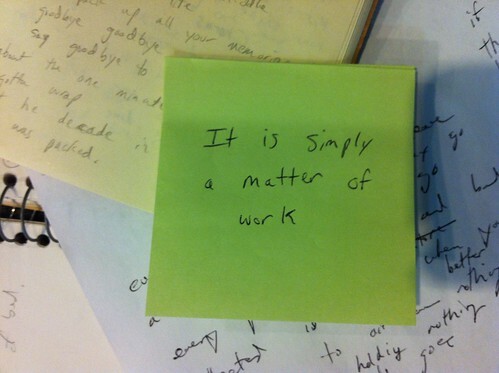 Then I got to this one, “It is simply a matter of work”. It’s funny how things work. Many years ago I thought about trying some rap. But I could never put it together and I knew it. Rap is harder then you or I think. If you are a rapper you already know this. For those that think rap isn’t music or think it’s easy please try writing/producing a rap song. Two years ago I wrote a rap song for a good friend’s 40th birthday. I should take on more of these requests because they end up producing some good stuff. This is what I finished in two days and sent off to him. I talked about the importance of perspective. This has had 2 years. I’m sure I like it. I’m sure it fits with the album theme. It needs an extra verse. It’s needs some production. I’m hoping to finish at least the lyrics out here in Maine. I’m on vacation. As my homework I’ve taken on writing these rap lyrics and trying Ableton Live. I think I’m ready to move on to the next song. Here is what the latest version sounds like. Here are some notes on what’s changed since the last version. Completely re-tracked the vocals. The old ones weren’t rehearsed enough. Added drums in parts. Again, here is that pattern I see popping up all over my songs. The kick is only present in the chorus. Added strummed acoustic guitar chords leading into the chorus. Reminds me of Pink Floyd. Added bass. I’m starting to convince myself I know how to think in bass. One thing I have over a sessions guy is I know the material very very well. Added a siren type sound. It’s actually my voice being pitched around by an auto tuner. I was shocked at how well that worked. Piano rhythms change up throughout. 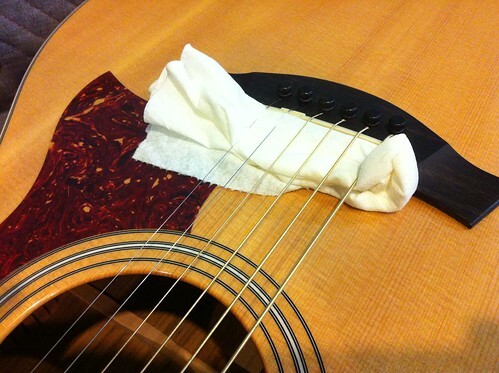 I used a paper towel to get a pizzicato acoustic guitar sound. I added some internet found sound for the Bart announcement. Added heavily distorted drums at intro. Added some vocals as pads. Heavy delay. Some auto tuning up an octave. Here is an example of the pizzicato guitar. Here is the auto tuned vox effect. There is a bit more then auto tune on this. But auto tune is doing all the pitching work. This is just the stock plugin that comes with Reaper. Next up a rap song. Something that was fully produced once before. But at the time it was a one day rush job. I didn’t get the sound I wanted. The importance of gaining perspective. After working on a song for a while it’s easy to loose perspective. Sometimes a throw away part is my favorite in hindsight. This has happened enough for me to get smart about it. Now I record a lot of ideas and review them after a day or two. A good monitor mix. I have never been in a studio where the monitor mix wasn’t rushed and needed tweaking (Granted most of my studio recording was under “budget strain”). A good mix lets you hear the relevant parts of the music so you can pitch, stay in time, and “feel” the music as you perform . It let’s you hear the nuances of your performance if you need to. Take the time to get it right. Why do I bring this up? I’ve been doing a quick and dirty monitor mix. I used headphones that were way too bass heavy. That was actually the biggest issue. Now I’m using some AKG 240s. It’s night and day. I can hear little details in my voice. Pitch better. Hear the music better. They are open headphones. Imo open headphones always sound more open. They have less resonant cavity. Could the music bleed into my vocal tracks? Sure. Maybe a little. Ask yourself what’s important? The world’s cleanest album or a good vocal performance? From that perspective it’s easy. Another tip worth mentioning; monitor with one ear open to the room. My voice never sounds natural through headphones. It always does in the room.